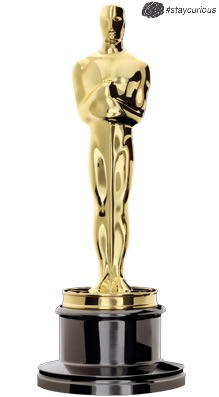 The "Oscar" from the Academy Awards stands 13.5 in. Tall & weighs 8.5 lbs. Although there are seven other types of annual awards presented by the Academy (the Irving G. Thalberg Memorial Award, the Jean Hersholt Humanitarian Award, the Gordon E. Sawyer Award, the Academy Scientific and Technical Award, the Academy Award for Technical Achievement, the John A. Bonner Medal of Commendation, and the Student Academy Award) plus two awards that are not presented annually (the Special Achievement Award in the form of an Oscar statuette and the Honorary Award that may or may not be in the form of an Oscar statuette), the best known one is the Academy Award of Merit more popularly known as the Oscar statuette. Made of gold-plated britannium on a black metal base, it is 13.5 in (34 cm) tall, weighs 8.5 lb (3.85 kg) and depicts a knight rendered in Art Deco style holding a crusader's sword standing on a reel of film with five spokes. The five spokes represent the original branches of the Academy: Actors, Writers, Directors, Producers, and Technicians. Don't forget to check out our Kickstarter Campaign! If you love Curionic pledge what you can! Even a dollar and a share helps! Hackney Carriage Drivers in London must pass "The Knowledge Test" proving their knowledge of the city. In 2006, "to understand and protect the home planet" was quietly removed from NASA's mission statement. 1 out of every 160 New Zealanders were involved in the production of the Lord of the Rings franchise.